The size and the movable range of TWENDY-ONE arm and hand are designed equally to those of the average adult female. The arm has seven degrees of freedom with one redundancy and the four-finger-hand has thirteen degrees of freedom in total to manipulate an object dexterously. As the mobility is an important rule of the service application, an omni-directional mobile mechanism is introduced to TWENDY-ONE. 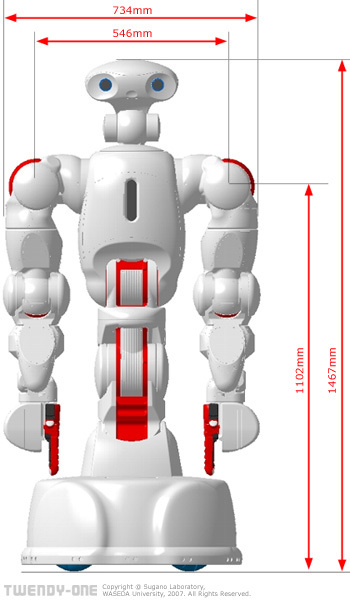 This mechanism enables the robot to easily follow and adapt to external and involuntary force applied from human. The trunk of WENDY-ONE has four degrees of freedom so that the hand can reach the floor to pick up an object and to wipe off the floor. The appearance is designed from the point of view of the human-friendliness. The outer shell is designed to cover all the wire harnesses and it also has the function of shock absorption.